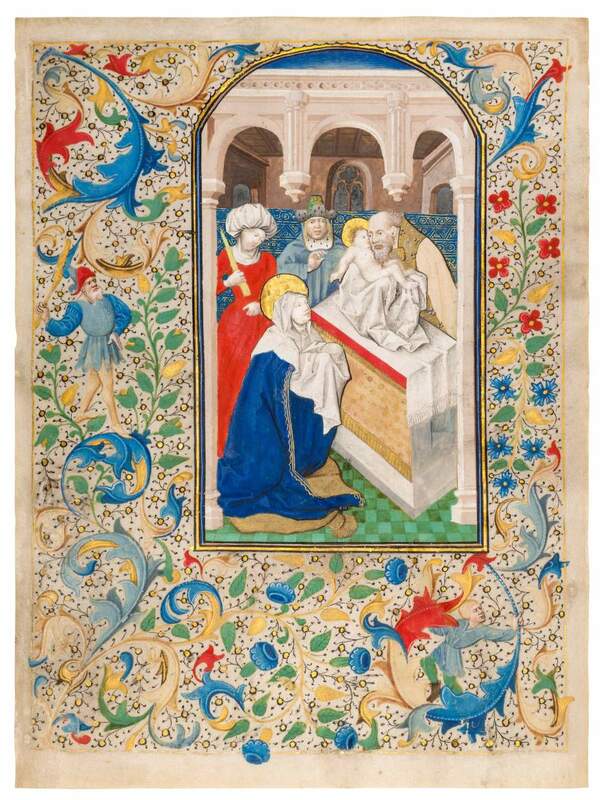 This miniature leaf, beautifully illuminated by the Dunois Master and his workshop, comes from a Book of Hours and originally would have opened the None of the Office of the Virgin. In a church-like interior stands an altar covered with a white sheet and adorned with a golden brocade antependium. Simon, the formerly blind priest, holds the naked child tenderly in his cloth-covered hands. The little boy seems to cling affectionally to the old priest’s neck – an extraordinary narrative detail in this miniature, as the Christ child is normally eager to return to his mother’s arms. Mary kneels before the altar and awaits the return of her baby, with her hands also covered in a piece of white linen. The whole scene is set before a magnificent, brocade cloth of honour in blue and gold. Two bystanders attend the sacred scene: a maid in a bright red dress and white bonnet, holding the sacrificial candle, and a very conspicuous man in a pale blue coat and green hat, both lined with precious ermine. He looks directly at the beholder and even seems to gesture to us with his hand. The surrounding border is handsomely decorated with fleshy acanthus leaves in changing tones, forming generous loops in which climb two characters who are merely decorative and unrelated to the main scene: one grim looking bearded man with a club and another with a tan cap.